Aylesbury FC have announced Davis Haule as the club’s new manager after Daniel Gordon stepped down last week. Davis is a non-league veteran having played over 120 times for Aylesbury FC as well as enjoying spells for Hendon, Harrow, Woking, Yeading, Staines, Hemel Hempstead, Ashford, Hanwell, Bedfont and Chalfont St Peter, in a career spanning almost 20 years. As a player Davis is an extremely hard working, creative and industrious midfielder that tears through midfields and is a consistent performer. A great leader on and off the pitch, he will bring a wealth of experience and knowledge at this level. Davis will be assisted by another veteran on the non-league circuit, Errol Dyer. Errol played for a number of London clubs throughout the eighties before having to retire with a knee injury. Errol then went into management with Southall, Wembley, Harrow, Egham and Northwood. The management team is completed by the current coaching staff, Paul Bonham, Ryan Wiffin and Aaron Norman who have all agreed to be part of the new team. The news comes after joint managers Danny Gordon and Gareth Risbridger resigned from their positions at the club. 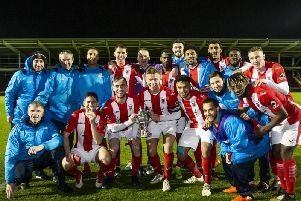 Danny, having already been well known at the club, and partner Gareth took the reins in the summer after Steve Bateman left at the end of last season. It’s been a difficult time for the pair as the majority of last year’s squad had left and they had the task of completely rebuilding the squad for this season. The results and performances have been inconsistent as the management team struggled to find the right formula and they decided that with a fair portion of the season still to play, they want to give the club the best chance to try and allow a replacement to turn the team’s fortunes around. Everyone at the club would like to thank Danny and Gareth for their hard work and commitment to the cause and wish them all the best in the future.